The play "Kamakura Sandaiki" was originally written for the puppet theater (Bunraku) and staged for the first time in the 3rd lunar month of 1781 in Edo at the Hizenza. It was adapted for Kabuki many years later and staged for the first time in the 9th lunar month of 1794 in Ôsaka, produced by the zamoto Asao Okujirô I at the Kado no Shibai [casting]. It was staged for the first time in Edo many years later, in the 2nd lunar month of 1818 at the Nakamuraza [casting]. The play is based on the fight between the Toyotomi and the Tokugawa clans and the siege of the Ôsaka castle. The drama was set during an older period and names were changed to disguise the protagonists' identity and avoid the Shogunate censorship: Hôjô Tokimasa instead of Tokugawa Ieyasu, Minamoto Yoriie instead of Toyotomi Hideyori, Miuranosuke instead of Kimura Shigenari, Sasaki Takatsuna instead of Sanada Yukimura, Sasaki Moritsuna instead of Sanada Nobuyuki and Sakamoto Castle instead of Ôsaka Castle. "Kamakura Sandaiki" was originally in 10 acts. Only one act survived, the third one, entitled "Kinugawa-mura Kankyo" (a cottage in the village of Kinugawa). Nowadays, it is staged once every 5 years. 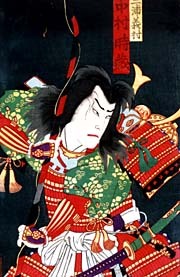 Miuranosuke, the brave young hero, comes home wounded from the battle because he has heard his mother is ill. 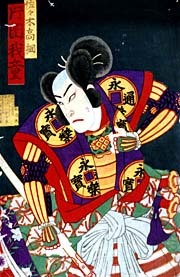 He serves the great Lord Yoriie, of Sakamoto Castle, on Lake Biwa, who has declared war upon Hôjô Tokimasa of Kamakura. Princess Toki, his betrothed, is the daughter of Tokimasa, and Miuranosuke finds that his future wife is the daughter of the sworn enemy, and that she is taking care of his mother in a poor country cottage, where they have taken shelter. Princess Toki in her long scarlet robe, into which is woven a pattern of golden winding water and flowers, and wearing a silver head-dress that forms a frame to her face--dainty, appealing, the very spirit of youth and devotion,--shines forth in her splendour. Miuranosuke makes a young warrior to suit the taste of the most carping of critics. Staggering through the audience, clad in sky-blue brocade and scarlet armour, the heads of the people in the boxes on a level with the hanamichi turn to see his entrance. He reaches the gate of the cottage and then sinks down from exhaustion. Princess Toki quickly restores him, and they express their devotion for each other in postures that instead of tearing the affections to tatters, as is the way with realism, suggest the depth of their feeling. The hero's aged mother, lying ill in bed, opens the shôji of her sick-room only to upbraid him for leaving the battle; she threatens to sever their relationship as mother and son unless he returns. Princess Toki tries to aid Miuranosuke to attire himself in his armour, and her grace and delicacy are emphasised by the efforts she makes to carry the heavy helmet, which at last she is obliged to drag across the floor of the cottage. Later Princess Toki is seen standing alone in quiet meditation by a dim oil light. Here is the eternal conflict in the female breast in all ages and all countries, the struggle between love and duty. Will she kill Miuranosuke's mother as her father has commanded, giving her a sword for this express purpose, or will she be faithful to her love? 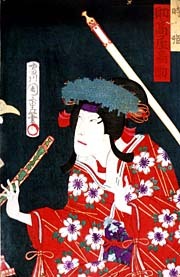 In the midst of her quandary a queer personage enters, dressed in the unmistakable costume of the Kabuki comedian: a bright yellow kimono with broad black stripes running from shoulder to shoulder, short baggy trousers made of horizontal stripes of brown and fawn, and the sleeves bound with broad bands of scarlet. To the overtures of the fool she turns a deaf ear. When Princess Toki is just about to kill herself as the only way out of the difficulties that beset her, Miuranosuke stops her and says his doubts regarding her loyalty to him are at an end. He begs her to live a little longer in order to dispatch her father, his enemy, and as he intends to die in battle, pleads with her to join him in death, when they can be married in another world. Rather poor consolation for Princess Toki this, but her love for him conquers and she consents. Then the spies come and say that they have overheard all, and the archspy robed in black hastens on his way to inform her father, when there issues out of the well in the garden a deadly spear-thrust, and he is killed on the spot. An imposing personage clambers out of the well. He is Sasaki Takatsuna, staunch supporter of Miuranosuke, who has been masquerading as the comedian, and in that capacity tested Princess Toki's fidelity. There is a sound of battle, the clash of cymbals and the thunder of big drums, Miuranosuke and Sasaki must away to the fray. Princess Toki, winsome and wistful, watches their departure. The title "Chronicle of Three Generations in Kamakura" comes from osakaprints.com.